Papers: Newspaper obituary in Tully Lodge No. 896 papers. Papers: ca. 1947-1965, 88.2 cubic feet. 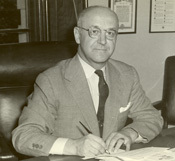 The papers of Congressman Roy Walter Riehlman.